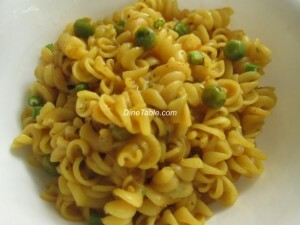 Masala pasta is a perfect and complete food for all. Pasta is an Italian food item but it is found in all over the world with different shapes and sizes. The whole wheat content have lots of minerals as iron, calcium, potassium etc. It is a healthy food and adding more vegetables makes more healthy. It can be used as a teatime snack or nalumani palaharam. Heat a pan and cook pasta with water till it gets soft and cooked. Drain the excess water and keep it aside. Heat oil in a pan, saute the chopped onion and green chillies till the onion becomes transparent. Then add the ginger - garlic paste and saute for 2 minutes. Add chopped tomatoes, green peas, turmeric powder, red chilly powder and cook till the tomatoes turn mushy. Add cooked pasta, tomato sauce, soya sauce, pepper powder, lemon juice, garam masala and celery and mix it well. Cook these mixture in a low flame for 4 minutes. Tasty masala pasta is ready.